Stamping with a Passion! : Taylored Expressions February Release!! Hello everyone and welcome to the Taylored Expressions February Release Day!!! Today is the day all the new TE goodies can be yours....you can find them in the new section of the Taylored Expressions Store!!! Be sure to check out the TE Blog, also, to see if you are a winner!!! 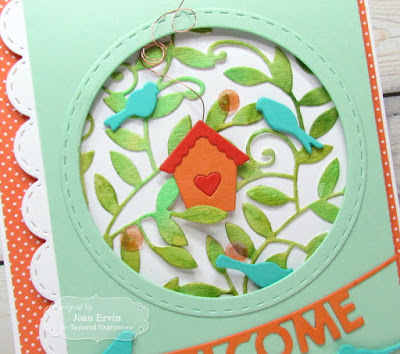 My card today features several new TE dies...The bird house was cut out of Pumpkin and Candy Corn cardstock with the Little Bits - Birdhouse dies and the birds were cut out of Cookie Monster cardstock with the Little Bits - Birds dies. The background leaves were created with the Leafy Vine Cutting Plate...watercolor paper was watercolored with several green reinkers first before it was cutout and adhered to a Sugar Cube background. The previously released Stitched Circle Stacklets were used to cut the circle and create the frame. The Mint Julep layer was then adhered to the Sugar Cube background with foam tape. The scallops were cutout of Sugar Cube cardstock with the previously released Stitched Scallop Edger die and the Sentiment was created with the Welcome Spring Banner dies...they were cutout of Candy Corn cardstock and the TE Sequins-Double the Joy and copper wire for the birdhouse finish it off. Thanks so much for joining us this week for the February Release...I hope you found a little inspiration along the way!! I LOVE THIS CARD!! My jaw dropped when I saw it!! Gorgeous work this week Joan! Awesome Joan! I LOVE this card! Beautiful design work! Fantastic design - love the colors you used! I'm ready for spring! Love the circle with the watercolored leafy vines! What a gorgeous color combo! So pretty, Joan! Just beautiful, Joan! 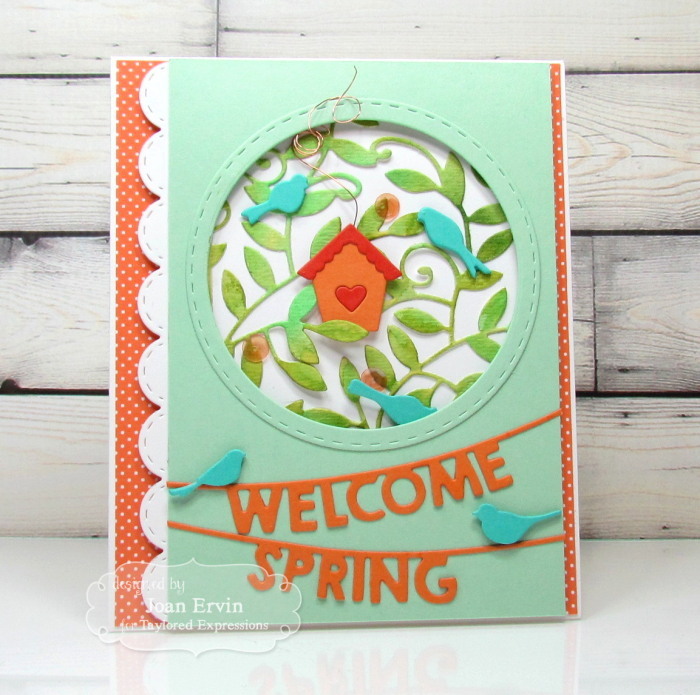 Love the watercolored elements and the hope of spring! What an absolutely sweet scene - and I love the way it is framed with the stitched circle. The birds on the banner are so cute. Beautiful card, Joan. I love the wonderful color palette and all the beautiful elements you used. Thank you for the inspiration.